Published on September 28, 2009 in Annoucments, Blogfolio and Websites by KreCi. I would like to let you know about my new project. It is Mini ITX Blog. It is very niche as it is only about motherboards. You may visit it here: "Mini Motherboard". Mini ITX motherboards are great choice for your mini home computer (home server for your files, media or great HTPC when connected to you tv!). You may read more about it on my new blog. I hope you will enjoy reading it as much as I enjoy writing. Published on August 25, 2009 in Annoucments, Blogfolio and Software by KreCi. 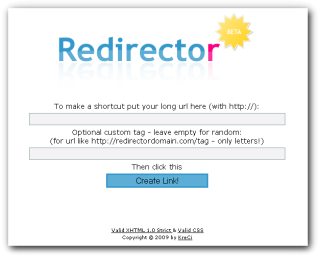 Here is a demo of my url shortening script. It let your visitors to make short redirections of their very long url's (for example it is useful for twitter users where they are limited to 140 characters). Script is made to be as simple as possible. HTML is separated from PHP so it may be customized by editing one HTML file without touching any PHP code! It do not need MySQL database - all data is stored in the file system. Users are redirected by .htaccess file to desired shortcut. Additionally there is administrator backend module to manage (edit/add/delete) url shortcuts. Below you may click for demo installed on my dev server. You may get a copy of this script for $30 (installation included) - contact me if interested. Update: Free version of this script have been released. Click here for more details. Tags: .htaccess, blog, html, mysql, php, portfolio, script. Published on July 30, 2009 in Annoucments, Blogfolio and Websites by KreCi. My last project have just been launched. 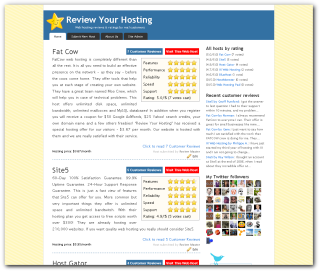 It is Web Hosting Reviews website based on customized WordPress and K2 theme. Below you may see front page screenshot. Click it to visit working site. There is a lot of customization in PHP, the design and a few customized free plugins just to make it work a desired way. Site presents web hosting companies and let's visitors to write a review, make a star rating and choose best web hosting offer by reading real users opinions. Tags: blog, k2 theme, php, portfolio, website, Wordpress. 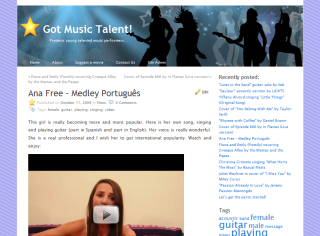 Published on April 22, 2009 in Annoucments, Blogfolio and Software by KreCi. Very simple to use PayPal shopping cart. It may be customized by CSS sheet to your needs. You can use any currency supported by PayPal and define any type of products or services to sell. There are two types of groups for selling items - with radio button (client can choose only one option from group) or with checkboxes (client can choose many options from the group). Number of groups in cart is unlimited! All orders details are available thru admin. Additionaly descriptions over and under shopping cart may be customized with simple templates. Script is written in pure PHP and data is stored in MySQL database. Demo shows example of using this cart for ordering “Wedding photographer”. If it doesn’t, probably someone have already been testing it… Anyway database resets every 24h so I am not going to change this description… If you want you may test it by clicking links below. Tags: blog, links, mysql, paypal, php, portfolio, script. Update: Script have been released under GPL license and can be downloaded for free. Click here for more details. Here is a simple ajax based user management backend written in PHP (with xajax libary). User data is stored in MySQL database. It is just a module that may be customized and used to any new script. Don’t be afraid to test as database resets every 24h. Tags: ajax, blog, mysql, php, portfolio, script.